The saturation point describes a point in water where the water cannot hold any more of a particular chemical, causing any extra material to remain suspended in the pool water. What is the Saturation Point in swimming pools? The saturation point, also known as the point of maximum concentration, is a point where an aqueous solution can no longer hold any more of a certain dissolved substance. Any additional substance usually appears in a different (non-liquid) phase, either as a solid precipitate floating freely in the water or along the sides of the container, or in gaseous form that forms bubbles and floats up and out of the solution. The saturation point depends on factors such as temperature and pressure of the solution, the chemical nature of the dissolved substance, the composition of the saturated solution, and any other chemical that may be present; as some chemicals can increase the saturation point of solutions. In swimming pools, the basic principle of saturation point is important, as the pool water can hold only so much of many chemicals. Shocking the pool, adding water balance chemicals like soda ash and baking soda, and metals and other minerals will push the water closer to its saturation point. 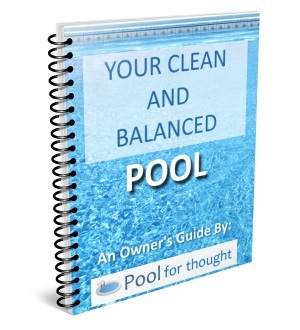 Total dissolved solids (TDS) is a measure of all the chemicals dissolved in the pool water. If the TDS level is too high, swimming pool water balance will be difficult to manage. The calcium hardness level is a test of how much calcium carbonate is dissolved. 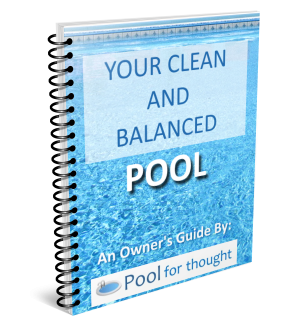 If too much calcium is present in the water, the extra calcium will turn the water hazy, cloudy, and eventually deposits of water scale will appear on pool walls and equipment. Copper and other metals in swimming pools dissolve in water, but once the water has reached its saturation point, any additional metal will show up as stains an discolorations on pool surfaces.